I LOVE the scent of AOS sandalwood but they chose to discontinue their EDT years ago. I'd been hunting for a replacement to no avail but Fine had it all along. This juice is banging. It does not smell like the sandalwood when first applied. I get a pretty stiff snootful of anise on application and that works just fine for me. If you are not an anise fan, fear not, it only lasts about 30 minutes and the sandalwood kicks in. Oh boy does it kick in. I smell it literally all day long. Projection and sillage are medium for a few hours but fade back to a "for me" scent for the rest of the day. I absolutely adore Santal Absolut. 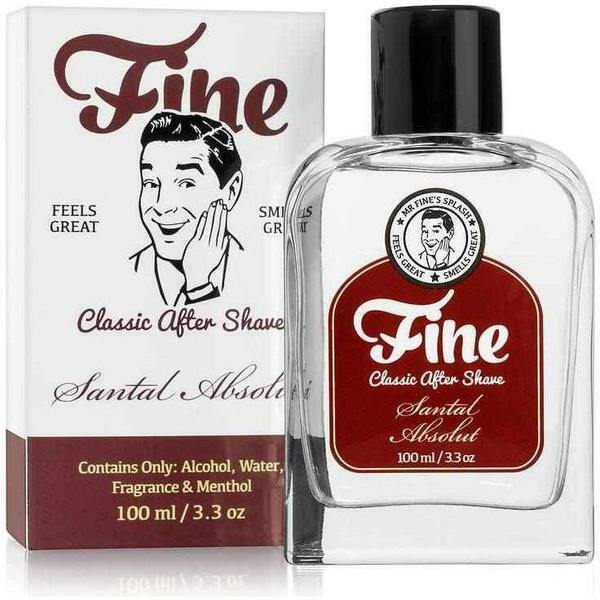 Fine nailed the Art of Shaving Sandalwood scent. In my opinion this IS sandalwood. This does not smell like a perfume but more like raw sandalwood. Beautiful. Scent lasts literally all day. Pretty much middle ground here. It'll clean you up after a shave but it contains no glycerine or emollients, or any other of the ingredients generally opined to care for skin. That said, works great for me. I love that sandalwood scent and nobody else does it so they got me on this one. Take my money please. Sure seems great to me. Perfect! Classic glass bottle. Tasteful label. Great colors and fonts. Smells nothing at all like real Sandalwood, this is reminiscent of a sweet cologne.